Last month, along with 3 other bloggers, Tesco Real Food set me the challenge of creating a Christmas Dinner menu for four people for £40 or less. Always one for a challenge, I accepted and was fairly confident that this was entirely possible. I love a good traditional Christmas Dinner menu so I opted for turkey with all the trimmings as my main course with a lighter starter and a pudding to please the children. This is a really quick and easy starter and isn’t too filling – there’s nothing worse than running out of steam before reaching dessert! 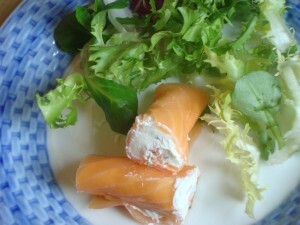 I mixed together half a tub of soft cheese with a tablespoon of chopped dill, a squeeze of lemon juice and some black pepper, spread it onto slices of sandwich smoked salmon, cut them in two and served with salad. Simple! The girls and I love sprouts, but only when they are cooked well – there’s nothing worse than soggy sprouts! I like using the baby sprouts, which were on offer in Tesco when I bought them, as they are easy to prepare and a good size. I’d never used chestnuts before in my cooking (only the type you get in a jar) and although there is a bit more effort involved in roasting them, it was definitely worth it. The girls were fascinated by the process and they smelled wonderful as they roasted. Preheat the oven to 200°C. 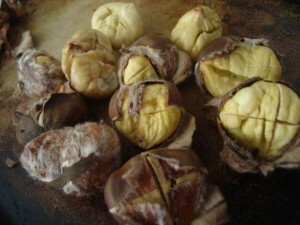 With a sharp knife, make a small cross in the skin of each chestnut – careful not to cut yourself, they can be quite tough! Place them on a baking tray and roast for 25-30 minutes until the skins have opened up. Leave to cool until you can handle them, then peel away the skins. The longer you leave them to cool, the trickier this is. Peel the outer leaves of the sprouts, wash them and boil for about 3 minutes until they are just tender. Drain and put into cold water to stop them cooking and help them retain their lovely green colour. Chop some bacon and fry in butter until cooked. Chop the chestnuts roughly and add them to the pan along with the sprouts. If you are using large brussel sprouts you might want to cut them in half. Fry for a couple of minutes until warmed through. Season and served. 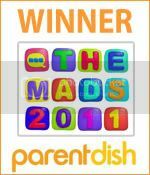 I wasn’t sure how the children would react to this dish as I don’t think they’ve tried it before but they really loved it. We will definitely be making this as a regular accompaniment to our roast dinners. Cut a red cabbage in half, discard the outer layers and the tough inner stalk. Wash and shred half of the cabbage. Finely slice one onion and fry it in some butter over a low heat until it is soft. 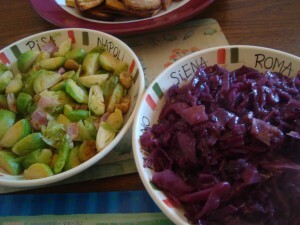 Place the red cabbage and onion in a large pan with a grated apple, 3 tablespoons of soft brown sugar, 4 tablespoons of red wine vinegar, 50ml water, 1/2 teaspoon ground cinnamon and 1/2 teaspoon of ground nutmeg. Place a lid on the the pan and cook slowly over a low heat for 45 minutes to 1 hour, stirring occasionally. I am the only one in my house who is a fan of traditional Christmas Pudding and to be honest, it can be a little heavy after a big meal. So I decided to go for something that contained elements of the Christmas pudding but was a little more appealing for the children. I half cheated with my ice cream by using a tub of ready made custard, but it saves time and tastes just as good. I did use brandy to soak my fruits in but if you want to avoid alcohol, you could use some fruit juice. Put 175g dried mixed fruit, 50g glacé cherries (halved), 2 tablespoons dried cranberries, 1 tablespoon dark muscovado sugar and 4 tablespoons of brandy into a saucepan and heat over a medium heat for 10 minutes. Allow to cool – you can leave it overnight if you are well prepared. Whisk together 300ml double cream with 3 tablespoons of icing sugar until it becomes thick. Stir in 500g ready prepared custard (I used Tesco Finest Cornish Custard). Mix the dried fruit with the cream mixture, put them into a freezer container with a lid and freeze. If you have an ice cream machine you can use this – I don’t! You will need to stir the ice cream every hour for about 4 hours. 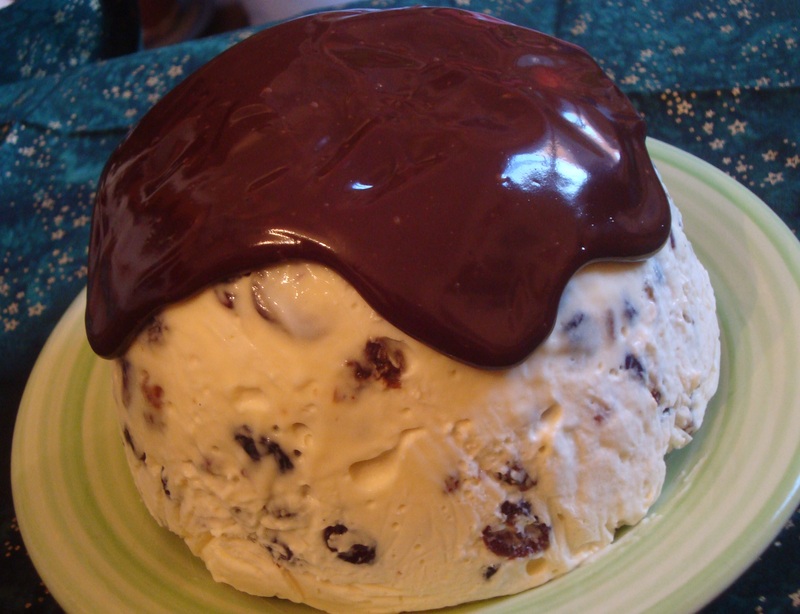 Line a 2 pint bowl with clingfilm, pour in the ice cream mixture, cover with clingflim and return to the freezer. You will need to remove it from the freezer about 30 minutes before serving. I covered the top with some chocolate sauce. Thanks to Tesco for sending a £40 voucher for us to buy the ingredients for the Christmas Dinner Challenge.